An atom is the smallest unit which forms the basis of innumerable chemical properties that are exhibited by an element. The scope of reactions although primarily influenced by the interaction of electrons, the number of protons differentiates an element from every other element. Neutrons, although not changing the chemical properties radically, do however play a crucial role in the modern-day technologies which range from use of radiopharmaceuticals to carbon dating to spectroscopy. The molecular compounds and the ions are totally different from the elemental forms when it comes to the chemical properties. So how does the knowledge of the number of neutrons become so important if even the elemental identity given by the number of protons is masked in a compound? Herein comes the importance of isotopes – two or more forms of the same element having different number of neutrons. What it means is that the mass of an isotope differs from that of another isotope of the same element. This difference in isotopes is very useful in analysis using mass spectrometry. Mass Spectrometry is founded on the principle of separation of the charged particles in vacuum through the force exerted by the magnetic and electric fields. This separation is a result of the mass-to-charge ratio (m/z) of individual ionic fragments. Often, the ions produced during mass spectrometry are singly charged (z=1), which effectively shortens the mass-to-charge ratio to the more easily calculated term mass. Before going further into the intricacies of understanding the output from a mass spectrometer, we should have a clear understanding of the terms mass number, atomic mass, and atomic weight. Atom is the most fundamental particle in chemical reactions. Chemical reactions are influenced by number of protons and electrons, but only negligibly by number of neutrons. Neutrons are the distinguishing factor in isotopes and this is useful in analyzing chemical composition by mass spectrometry. Mass number, as the name suggests, is purely a number without any unit. It is the sum of the numbers of neutrons and protons in an atom. This number is the distinguishing factor for isotopes. For example, the three isotopes of hydrogen are represented as 1H, 2H and 3H where the numbers 1, 2 and 3 are the respective mass numbers. Atomic mass is the actual mass of an isotope expressed in atomic mass units (amu or simply u). It is to be noted that the masses of both neutron and proton although very close, are not exactly equal to 1 amu. Hence, the atomic mass can be fractional while the mass number is always a whole number. The third term we need to know is the atomic weight. It has its origin in the “relative natural abundance” of isotopes. Since there is more than one isotope for any given element, it is obvious that the total number of all the atoms of that particular element will have a certain percentage of each of those. Let’s take the example of Chlorine. It has two stable isotopes namely 35Cl and 37Cl. In the periodic table however, the mass of a chlorine atom is given as 35.45 u. This results from the relative abundance of 75.76% of chlorine-35 and 24.24% of chlorine-37. Atomic Mass = actual mass of an isotope expressed in amu. Atomic Weight = Average of the masses of the stable isotopes of an element according to their natural abundance. The technique of mass spectrometry can distinguish these two isotopes of chlorine and similarly, any number of isotopes an element may have. The output is presented in an xy plot where the x-axis represents the mass-to-charge ratio and the y-axis represents the relative abundance. When applied to a sample of a pure element, the mass spectrometry reveals each isotope as a separate peak. This technique can be used not only for identifying the relative abundance of isotopes in a sample of element, but also to identify the presence and percentage of each element in a compound. Since the relative abundance of isotopes is used in this technique, the y-axis does not have any unit and hence, the highest among the peaks obtained in a mass spectrum is assigned as the “base peak” and taken as 100% (not to be confused with the total abundance of each element). All the other peaks are assigned as a percentage of the base peak. Exact mass – It is the calculated mass obtained by summation of masses of individual isotopes. If an exact mass is presented without mentioning the isotope, it is generally considered to have been calculated with the mass of the most abundant isotopic species. Molecular weight – It is the summation of atomic weights of the elements present in a compound. Accurate mass – Defined by IUPAC as “Experimentally determined mass of anionof known charge”. This is used to determine the composition of elements in a compound. This is the mass obtained from the m/z ratio. Mass spectrum is obtained as an xy plot where the x-axis represents the mass-to-charge ratio and the y-axis represents the relative abundance. The highest peak is taken as the “base peak” (100%) and all other peaks are assigned as a percentage of that. Exact Mass = summation of masses of individual isotopes. Molecular weight = summation of atomic weights of the elements present in a compound. It can be clearly seen that the chlorobenzene with a natural abundance of both isotopes of chlorine has a MW of 112.56 which is slightly higher than that of the chlorobenzene sample made entirely with chlorine-35, as it should be since the abundance of chlorine-35 is 75.76%. In contrast, the 3rd sample made entirely of chlrorine-37 has a MW of 114.07 which is exactly greater than that of the 2nd sample by 2. This is the obvious reflection of difference in masses of the two isotopes of chlorine. The same trend is observed in the experimental m/z ratios of the three samples. The first sample is also found to have the peaks of both the isotopes of chlorine which confirms the presence of both. The benefits of detecting isotopes makes mass spectrometry as one of the best methods for structural assignments in all fields of chemistry. A mass spectrum can identify the number and percentage of isotopes present in a compound. 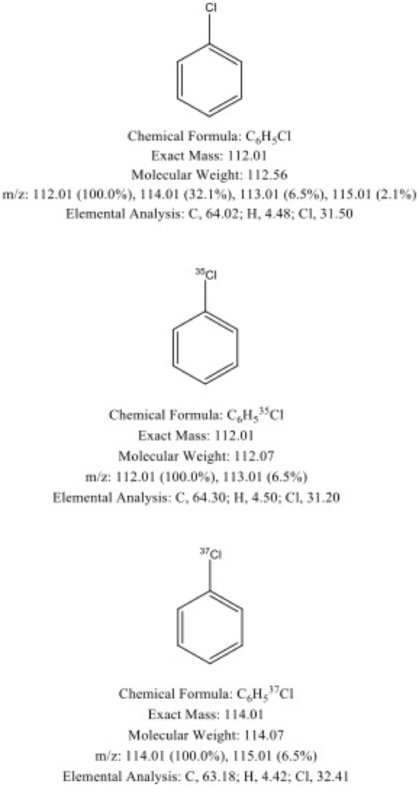 Chlorobenzene made with natural abundance of chlorine has base peak at m/z = 112.01, but also has a peak at m/z = 114.01 which indicates the presence of both chlorine-35 & chlorine-37.